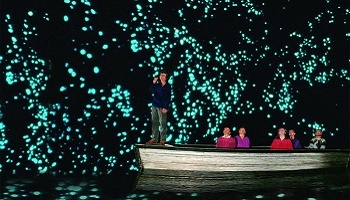 Waitomo in New Zealand is renowned for its famous underground glowworm caves. The Waitomo Glowworm Caves, New Zealand are a few kilometres from the small farming community towns of Otorohanga and Te Kuiti, just south of Hamilton. Waitomo Glowworm Caves are easy to get to, and you can include them on most itineraries, as they only three hours south of Auckland, one hour from Hamilton, and slightly more than two hours from Rotorua or Taupo. 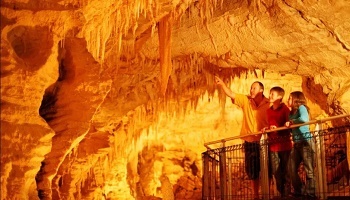 Waitomo's attractions and adventure activities are mainly associated with the underground limestone glowworm caves that are Waitomo Glowworm Caves. There are a whole range of adventure trips including black water rafting, abseiling down huge underground chasms, and underground adventure. 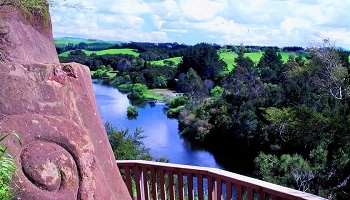 At Waitomo you can also go one a horse riding trip or take a quad bike trip. Only a few kilometers to the west there is some great fishing, surfing and spectacular coastal scenery. Here you can stay and relax in one of the small seaside towns of Kawhia, Marokopa or Mokau. Whilst there do not forget to take a short walk to see the Marokopa Falls; or scoop out some sand at low tide and make your own private hot pool at Te Puia (meaning Hot Water) Beach near Kawhia.